I had a layover in Salt Lake and we actually flew right over BYU. In my past experience we typically do not fly in that way. It was nice. 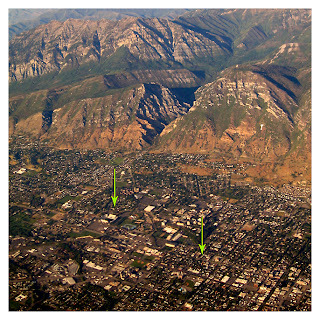 The arrows show where I used to live my last year at BYU and the location of the building that housed all my classes. As you can see it is quite the walk to make, sometimes multiple times in a day. Sometimes I miss school ... those were some good years. Did I mention that I love the mountains? I do. How is this for a view while you are waiting at the airport. Beautiful! 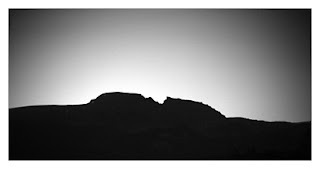 I was only sorry I was stuck inside and missed being able to photograph the sunrise on the Tetons. My mom was kind enough to stop a couple of times for me on the way to the airport and I got the bottom image and I also took a quick one of the Sleeping Indian. wow, these are just breathtaking. This is making me so homesick. I am a lot closer than you, but I only make it home a couple of times a year. We are headed home this weekend to go on a yellowshone adventure. 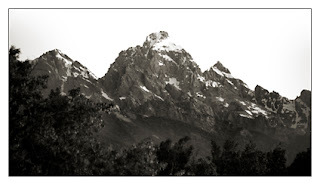 The pictures of the Tetons made me so excited.